~ Sprouts provide the best nutritional value of all land based fruits and vegetables and have many important curative properties. ~ Sprouts contain concentrated amounts of photochemicals that can protect against disease. ~ Plant estrogen present in sprouts increase bone formation and density and prevent bone breakdown and osteoporosis. ~ Saponins found in sprouts lower bad cholesterol and stimulate the immune system. ~ Studies prove the benefits of sprouts in arteriosclerosis, cardiovascular diseases and cancer. ~ Sprouts contain active antioxidants that prevent DNA destruction and protect from ongoing effects of cancer. 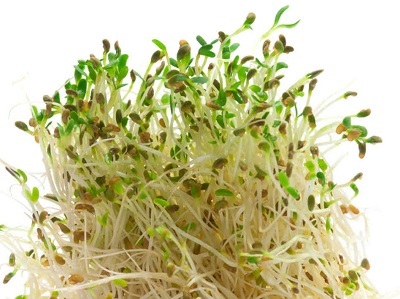 ~ Because sprouts are living, growing food sources, they have a rich supply of enzymes. ~ Sprouts have an abundance of oxygen that prevents the growth of cancer and bacteria cells. ~ Sprouts are alkaline and improve the immune system. ~ Sunflower sprouts contain a full spectrum of amino acids and vitamin D. They contain chlorophyll and minerals and are a sufficient source of protein. ~ Sprouts contain lots of chlorophyll, which helps detoxify the liver and the blood and are an excellent source of phytosterols, which reduce cholesterol, enhance the immune response and decrease the risk of certain cancers. ~Pea sprouts contain lecithin and are a considerable source of chlorophyll and proteins. ~ Use sprouts in the same way as you would wheat grass. ~ Juice sprouts with masticating juicer, not centrifugal. ~ Add to green juice or consume separately like wheat grass.